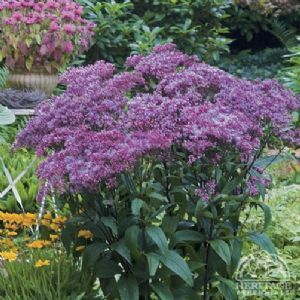 Eupatorium dubium 'Baby Joe' NEW! The perfect size for smaller gardens, this is a lovely selection of Joe-Pye Weed, even smaller than 'Little Joe'. It forms a bushy upright mound of coarse dark-green leaves, bearing large umbrella-like heads of magenta-pink flowers in late summer. A magnet to butterflies, suitable for planting in moist to wet areas. Ideal as a focal point in a large container or tub. Dried seedheads offer good winter interest and the flowers are good for cutting for indoor use.